If you’re looking to go do something this weekend, you have two excellent options in Vermont: CarnageCon and the Vermont Steampunk Expo! 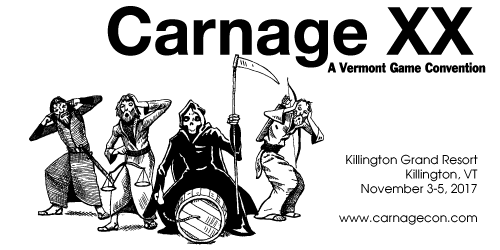 CarnageCon is Vermont’s long-running gaming convention, taking place at the Killington Grand Resort starting today and running through Sunday. This year is the 20th anniversary. This is a weekend of table-top, board, and roleplaying games. Preregistration has closed, but you can still attend. Here’s the schedule. The other big event will be held on Saturday and Sunday, the Vermont Steampunk Expo, which will take place at the Sheraton in South Burlington. Tickets are $25 for one day, $40 for the weekend, while kids under 12 get in for free. The event will showcase panelists, artisans, crafters, and performers, covering everything steampunk.